"Yoritomo no Shi" was premiered in April 1932 at the Kabukiza [casting]. The shôgun Yoriie, who is Yoritomo's son, is attending the third year rites memorial rites for Minamoto no Yoritomo at Hokkedô Temple. A guard tries to get the crowd to disperse because Yoriie isn't coming and the crowd shout that Yoriie is not a dutiful son. Yoriie's attendant Yoshinari, appears to report that Yoriie is in the temple hall mourning for his father and tells the guard to disperse the crowd. Two women in veils approach the gate and are stopped by the guards and as they are being questioned a man wearing a head scarf appears. Yoshinari asks him to take the scarf off revealing himself to be Hatakeyama Shigeyasu who, it had been thought, would not be attending because of illness. 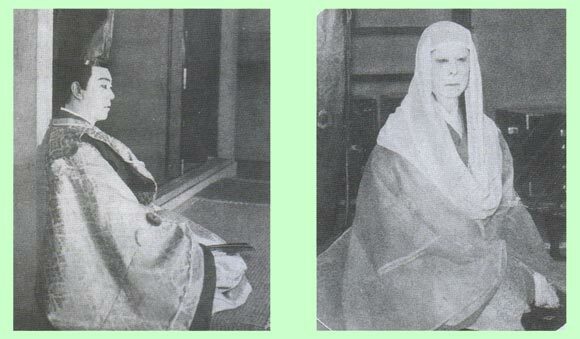 Shigeyasu thinks he recognises on of the ladies in waiting as Lady Masako, the widow of Yoritomo. Suspecting that trouble may be brewing Yoshinari instructs the guard to loo after the women and enters the temple. The lady-in-waiting is not Lady Masako, but Kosuô. Lady Masako, who said Kosuô was the right person to carry out the task, has ordered her to place a memorial tablet of Yoritomo on the altar. Shigeyasu tries to find out why but Kosuô doesn't know. Accompanied by her attendant Otowa, Kosuô goes to place the memorial tablet. The attendant Lords start to arrive, one of them taking the opportunity in passing to castigate Shigeyasu, who was with Yoritomo when he died, for having even considered being absent from Yoritomo's memorial rites. As a sutra is read aloud Shigeyasu, who holds a secret, is pained at not being able to attend. When the head retainer. Ôe Hiromoto, arrives Shigeyasu confesses to him that three years ago, whilst on guard duty, he had attacked and mortally wounded someone disguised as a woman who had refused to reveal their identity . That someone turned out to be Yoritomo who had been on his way to a secret romantic liaison with a woman. Yoritomo had forgiven Shigeyasu who had only been doing his duty. Because of the potential repercussions from Yoritomo's behaviour which had resulted in his death Lady Masako, Hiromoto and Shigeyasu decided to keep the cause of Yoritomo's disgrace a secret and concocted the official cause of Yoritomo's death as the result of a fall from his horse. Shigeyasu intends to commit seppuku but Lady Masako and Hiromoto forbid it as dishonourable and Hiromoto forcibly makes Shigeyasu enter the temple. As Kosuô and Otowa leave the temple Kosuô hesitates wanting instead to wait for Shigeyasu with whom she is in love. Otowa goes back into the temple to fetch Shigeyasu who, unable to attend the rites, readily leaves and as he passes Kosuô tries to ignore her. Under pressure Shigeyasu tells Kosuô the real cause of Yoritomo's death. Kosuô, feeling shunned by Shigeyasu, burst into tears as does Shigeyasu, both secretly watched by Yoshinari. Yoriie, alone, is becoming agitated and neurotic, suspicious of the real cause of his father's death. Nagatsune, his attendant, announces the arrival of two abbots, who are waiting for Yoriie to rule on their competing claims to the same temple lands. Lady Masako tries to prevent him dealing with the issue but he orders Nagatsune to bring them in. As they wait for the priests to be brought in Yoshinari appears and says that he is suspicious of Shigeyasu and Kosuô who, he thinks, both know something about Yoritomo's death. Yorie orders them brought before him for questioning, though in the meantime the two priests arrive and Yoriie, who refuses to listen to their protests awards each of them half of the temple grounds and dismisses them. At that point Shigeyasu appears and petitions Yoriie to allow him to leave his service and become a priest, something which Yoriie forbids unless Shigeyasu confesses the truth about Yoritomo's death. Shigeyasu remains silent. Lady Masako and Hiromoto appear while Yoriie is questioning Shigeyasu who then questions his mother, Lady Masako, who tries to reassure him and calm him down. Yoriie feels that he needs the company of a woman and, to everyone's surprise, Kosuô is brought to him. Yoriie promises Kosuô that if she confesses the secret he will ensure she marries Shigeyasu who, at a signal from Lady Masako, kills Kosuô with his sword. Yoriie attacks Shigeyasu but is stopped by Lady Masako who tells Yoriie that the clan has to continue in power, even at the expense of her love for him and his life she will not reveal the secret about Yoritomo's death. Yoriie cries in frustration. He knows it's not he who holds the power in the clan but his mother. The others look on wondering what Yoriie's behaviour may mean for the future of the Minamoto.